The end of the year is a great time to sit back, reflect and be grateful for all the wonderful things that have happened in the past year. Like puppies. And their names. Just like we did in 2011 and 2012, we searched through Vetstreet's database of 925,000 puppies born since January 1 to determine what the most popular puppy names of the year are. While the top 10 don't yield too many surprises, we're noticing a few trends and have our eyes on a few rising stars. The female puppies mixed things up a bit this year. The top four — Bella, Daisy, Lucy and Molly — remained No. 1 through 4 for the eighth straight year. Previously, Daisy had held the top spot for two years (2004-2005), and Molly had been No. 1 for four years before that (2000-2003), but Lola, which had moved up steadily over the past decade and jumped three spots to land at No. 5, dropped two places to No. 7. Sadie and Sophie changed their order and moved up, claiming Nos. 5 and 6. Chloe and Maggie held tight at No. 8 and No. 10, but last year's No. 9, Coco, dropped down to No. 12 after only a year on the top 10 list, with Zoey moving up from No. 12. 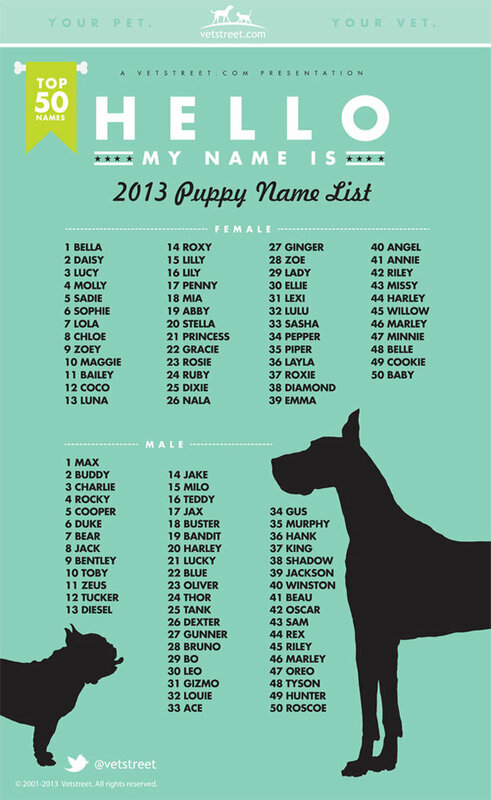 While there was a bit of place-hopping, the top 10 most popular male puppy names stayed the same. In fact, the top five were exactly the same as last year, with Max at No. 1 for the eighth straight year, Buddy at No. 2 after spending four years in the No. 1 spot (before Max took over), and Charlie, Rocky and Cooper rounding it out. No. 6 through No. 10 saw a bit of movement, with Duke moving up two spots to No. 6 and Jack moving up one to land at No. 8, which caused Bear and Bentley to move down on the list, one and two spots, respectively. Toby continued to hold its position at No. 10. Zoey isn't the only rising star in the top 50 names, but it's worth noting that it has been gaining popularity quickly, moving up from No. 33 10 years ago. Luna is the hottest female puppy name on the list, moving up from No. 84 a decade ago and jumping five spots since only last year, from No. 18 to No. 13. Diesel, which landed at No. 13 this year, is the hottest male puppy name, climbing three spots since last year.